I'm privileged to be test knitting Jeri Rigg's new design "St. Margaret". 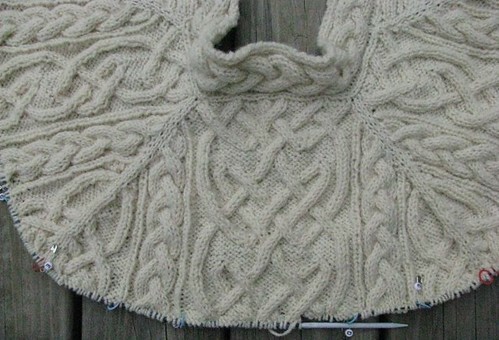 This is an innovative way of knitting from the top down, with raglan sleeves and incorporating a lot of cables. The sweater grows out of the initial back neck and can become a pullover or cardigan. This is a view of the full sweater to Row 51. Currently I'm 6 rows away from deciding on cardigan or pullover and probably will keep it a cardigan. 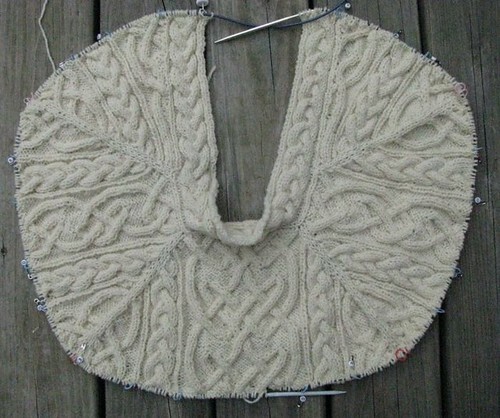 Jeri has written this pattern for a finished size 38" chest, using DK weight yarn. I need the sweater larger so am using Briggs & Little Regal, a full bodied worsted weight on a US #8 circular. Here's a closer view of the work. It's really exciting to see what comes next and how it will grow below the armholes. Wow . . . that's a really neat design! I'm going to have to get the pattern when it's completed. Do let us know when it is available. Stunning! looks like a fun pattern to try. I'll look forward to seeing the finished pattern.